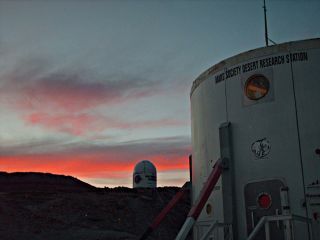 Utah's Mars Desert Research Station under the 'Martian' sky, with the Musk Observatory in the background. VeronicaAnn Zabala-Aliberto, National Space Society Projects and Events Coordinator forChapters is on a mission. A mock mission to Mars, that is. Veronica Ann, along with her children, manned the MDRS, MarsDesert Research Station analogue, in Utah. Veronica Ann, who is also thefounder and current President of the Phoenix Chapter of NSS, served ascommander (CDR) during the mission and took time from her busy schedule on Marsto send reports to other Spacers around the globe. Our firstcouple of days have been "normal." A shortage of water and ourgenerator not charging its batteries in order to keep our systems up andrunning. Our children keep busy with their school work and are acclimatingthemselves to the longer Martian Sol. They e-mail their teachers, family andfriends back on Earth when they have their free time. The Crew is a littlefatigued with the longer days and the technical difficulties but they areadapting quite well. I amimpressed with the level of skill this Crew has exhibited and how well they getalong with each other, especially with the younger Crew Members. This is ourvoyage of discovery...discovering not only our new home but discoveringourselves, on how much we are able to contribute to our mission as well as howmuch we are able to handle ourselves in a restrictive regime. The Family LivingAnalysis on Mars Expedition Crew is currently on its third major mission ofdiscovery. Even thoughwe have new faces on each and every mission we all are appointed certain tasksto ensure that we lead a productive and safe mission. Our youngerCrew Members, four in all, are being apprenticedin geology, chemistry, biology, history, engineering and much more. Theyare learning the protocols of Martian life. Discipline is something that shouldbe instilled in all Crew Members; young and old alike. We all share in thework. Even as the Skipper, today I spent close to two hours washing the dishesthat we could not do because of the lack of water until we resolved the problemwith the water tank. Pyscho-social factors test techniques, in order tomaintain an effective mission. F.L.A.M.E.,Family Living Analysis on Mars Expedition, is the first in analogue missions todo just that which include children under the age of fourteen. We have aninternational crew unto which there are no issues with them speaking in theirown languages amongst themselves. Respect is another key to a successfulmission. We each respect each other's culture, religion and privacy. Dependencieson everyday tasks are crucial in order to keep morale up and the Hab in order. Somebehavioral markers have been noticed when dealing with the F.L.A.M.E. students.Once adjustment to an already recognizable environment is achieved the childrenfeel relaxed and mark their respective territories with their personalbelongings such as toys, clothes and sleeping equipment. The children'sperception of tension, cohesion and leadership is different than that of theadult Crew Members. The parents and the Educator are the main role models inthis sort of environment. They learnto implement new procedures and conduct special projects that are not offeredin classes back on Earth. This is an excellent way for children to activelyparticipate and contribute to their environment. Our typicalday consists of everyone waking up early and having breakfast and our morningbriefing sometimes at the same time. The children then prepare for theirclasses which are conductedin the galley. The adultsget to work either by going on EVA to scout out for possible buildingmaterials, ground water to add to the already existing supply the Hab has, andpossible features that can be used for shelter from the harsh environment. TheEngineers work on the Hab's systems to ensure the Crew has power to communicateto Mission Support and electricity to conduct experiments in the sciencelaboratory. Other Crew Members go to the GreenHab to plant seeds so they willhave fresh food to eat in the coming weeks. We try to get together for lunchbut sometimes a few of the Crew eat later because of the tasks they are workingon or because they are on EVA longer. One thingthat is constant is that everyone comes to the galley for dinner. Here we cantalk about our day to keep everyone informed, share our stories from the past,or share some visions for the future. Afterdinner the children help clean up and the adults sit at the CommunicationsConsole and write their reports for Mission Support and for the people back onEarth to read. Sometimes we have "Movie Night" and everyone camps outon the floor to watch a movie and eat popcorn. Then we allgo to bed. Our days are long but productive. By theF.L.A.M.E. Crew's efforts we hope to give a renewed enthusiasm for humanexploration. With a predetermined destination we embark on a voyage in which wehope to inspire our children and others to reach as far as they can, forexploration is the act of searching for the purpose of discovery. Explorationchallenges us. Have you felt challenged lately? If not, what can you do to be apart of the wonders of space exploration? VeronicaAnn Zabala-Aliberto is the founder and president of the NSS Phoenix Chapter andserves as NSS Projects and Events Coordinator for Chapters. The MDRS Crew 59'sF.L.A.M.E. expedition ran from March 4-17 earlier this year. IMAGES: Mars Base of the Future? NOTE: Theviews of this article are the author's and do not reflect the policies of theNational Space Society.